Automated On-Line Sampling Solutions from Flownamics now with the Nova BioProfile FLEX 2 Interface. 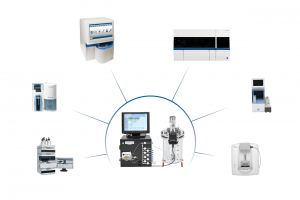 With over 17 different analytical /collector interfaces available, the Seg-Flow integrates with more instruments and analysers than any other auto-sampler on the market. The Seg-Flow Automated On-line Sampling System provides multiple bioprocess monitoring and control solutions for improving process performance. The Seg-Flow system’s patented Segmented On-line Sampling™ technology allows rapid and accurate sampling for 8 vessels or process streams and sample delivery to 4 analyzers and/or fraction collectors. Several feed control options are available with the Seg-Flow system, which can control 2 pumps per vessel. Existing off-line and at-line analytics are seamlessly integrated into a multi-functional on-line PAT tool through the Seg-Flow system’s communication interface and FlowWeb™ control software. The FlowWeb software simultaneously acquires all integrated instrument data and can export the data to any OPC-enabled SCADA for enhanced process monitoring and control. Broadley-James Ltd is the UK and Ireland distributor for the Flownamics Inc product portfolio.